Little is known about the gardens of India's ancient Dravidian population (see Glossary). The oldest stone buildings in India were made at Harappa in the lower Indus valley but their script has not been deciphered and there is no way of knowing whether the small outdoor courts in their cities contained plants. The Harappans arranged streets on a grid plan and formed courtyard houses. There is less archaeological evidence of early gardens elsewhere in India but the ancient Hindu sacred books [eg the Ramayana and the Kama Sutra] give a remarkably detailed account of gardens in Ancient India. Europe has more archaeological evidence of its ancient gardens but less textual evidence. The fertile plains of Indid were forested and buildings were relatively temporary structures in timber and mud. Circular huts with thatched roofs were built on a pattern still used for grain and fuel stores. 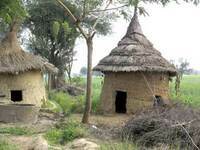 Village dwellings consisted of a fenced compound containing mud-built huts with thatched roofs. A distinction was made between short-life and long-life buildings. Temporary buildings (kachha - unripe, raw) were made of mud, wood and grass. Permanent buildings (pukka - ripe, cooked) were were of stone and burnt brick. Hindu palace and garden construction was kachha and has not survived. Hindu temples were pukka and many survive in South India. In North India they were often destroyed by Muslim invaders. The earliest Indian palace to have been excavated, at Vijayanagara, has stone bases for a timber columned hall. Later Indian palaces were built within forts and had less outdoor space. A mardana pattern was used: a stone-paved courtyard (chowk) surrounded by residential apartments. In time, and under muslim influence (see below), palaces became more spacious and chowks evolved into enclosed gardens. Rajasthan, which retained independendent kingdoms under Moghul suzerainty, has the best examples of fortified palaces with gardens. Later Hindu palaces were pukka - built in stone, often on dry hills and heavily fortified. This constrained opportunities for garden making, as in medieval Italy, because space and water were both in short supply. Many were rebuilt with Muslim influence. Gwailor, already a citadel in the 8th century, was rebuilt between the thirteenth and eighteenth centuries. Jodhpur is a stark hilltop fortress with a chowk (courtyard) as its central feature. Daulatabad is a hilltop citadel. Golconda is a fortfied hill rising 130 metres above the plain and supplied by an elaborate water system. Bidar has a fortified palace and town with small paved courts within the palace. From the 12th century onwards India was progressively occupied by Arabs, Turks and Mongols. They came from the west and north bringing knowledge of a new religion (Islam), new weapons and new building techniques. They used mortar to make stone arches, hitherto unknown in India. When the Muslims became conquerors, forts were required to protect the rulers' elegant stone palaces, as at Delhi and Agra . Both have lost the mud buildings which comprised the servants quarters within the fortifications. They are described as Mughal, which is an Indian version of Mongol. Muslim kings also introduced a new building type to India: royal tombs of the kind built for Timur in Samarkand. Tombs were not part of the Hindu tradition, because life and death are seen as part of an endless cycle of rebirth. Arabic Islam had discouraged elaborate tomb building as a type of self-glorification, contrary to the principle that all men are equal before God. Nor had the Mongols built tombs in their nomadic centuries. The practice of tomb-building may have been inspired by Buddhist stupas or, more probably, by China. Chinese emperors had long built tombs in protective enclosures. The Rajputs, a warrior class, retained much of their power during periods of Mughal and European influence. The style of their palaces and gardens became partly Hindu and partly foreign-influenced, their form relating to the classic Indian townhouse and farmhouse (haveli): rooms opening onto a courtyard (chowk) with a wall to give protection from the outside world. 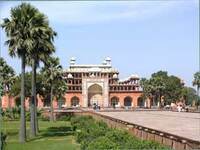 Palace forts had immensely strong fortifications and specialised chowks for men, women, relatives, guests, cooking, horses etc. Under Muslim influence, and with increased prosperity, chowks developed into paradise gardens. This was a progressive development with garden design playing an increasingly significant part in palace layout. Orchha, on a fortified island in the River Betwa, has several palaces within its walls, some with gardens. Chittor has a great fortress, on a ridge, with roof terraces and balconies overlooking the surrounding landscape. Udaipur is a vast composition of palace, garden courts, artificial lake, island gardens, forests and hunting lodges. Mandu –The ‘City of Joy’ - has a spectacular site and a garden palace (Jahaz Mahal) built between two lakes. Amber has an island garden outside its fortifications, internal garden courts and an old mardana with a central chowk. Jaipur is an integrated palace and city design. Deeg is protected by moats and fortifications but the palace buildings are located on the axes of a chahar bagh type garden. As European influence on India became significant, several factors contributed to a new wave of palace building. First there was more security than during the last 150 years of Mughal rule. Second, there was more wealth as new technology and trading opportunities benefitted the Indian economy. Third, the Mughal law requiring the transfer of wealth and property to the imperial treasury after a man died had discouraged private palace building. For all these reasons there was a building boom from the eighteenth century onwards led by Indian princes. Portuguese and French influence was strong in South India. Not seeing themselves as colonists, the British built few large estates for their own use but British architects were active in India. To begin with, the new palaces were built style was a blend of Mughal and Rajput. As the nineteenth century progressed European influence became stronger but was rarely dominant. Indian buildings and gardens remained distinctively Indian, including the government complex in Delhi designed by Edwin Lutyens. Hyderabad has an extensive walled compound (the Chau Mahalla - Four Halls) with buildings composed with formal gardens and water tanks. At Baroda the Lakshmi Vilas is arranged round three courtyards (for the public, for the maharaja and for the women) and is set in a large landscape park. At Jodhpur a new palace was designed, by a British architect and 3 km from the old fortress, to draw upon Indian motifs..
Aryan: the word means 'noble' and is used for the Sanskrit-speaking Indo-European people who settled Europe and North India. (Hitler used the word Aryan to describe people with fair skin and blue eyes). Rajput: 'son of a king' and thus a member of the Hindu warrior caste claiming descent from Kshatriyas, to which Hindu Kings belonged).